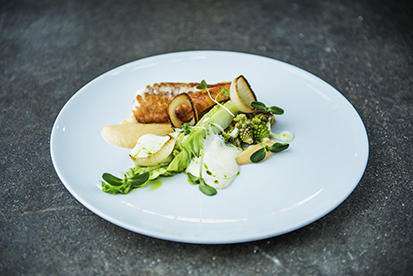 In the heart of Stavanger, by Vågen bay, sits the fishmonger and restaurant Fisketorget. The restaurant has taken seafood to a new level, selling whatever the ocean provides. And with the North Sea almost pouring in through the door, they do not have to go far to make a catch. in, a chef yells over your head “Guests at the door!” You have been spotted. Still confused as to whether you are finding yourself in an Italian port, South Asian fish market or a busy Mediterranean village, you are shown to a table – that is, if you have booked one – by a smiling sommelier. Where is the menu, you ask? Your lovely guide points to a large blackboard, just as a chef wipes a dish out and writes something else in its place. That is right. The second supply of fish of the day has come in, and it is different to the first. Here, the menu has to adapt to the sea. To some it might sound like something from a TV show, and it does all have a touch of Masterchef about it. But this is not a TV studio, this is a kitchen, and a very busy one. With fresh fish coming in up to three times a day, and often without really knowing what kind it will be this time, the chefs have to think on their feet. “We always start the day by looking at what our local supplier and the sea have provided us with that day,” Pallesen explains. “Then we throw ideas out there – what do we want to create?” And so it is, with perhaps the best produce of the world, that the kitchen takes upon it this challenge. Thankfully, the local vegetables and seafood are in the best of hands. Pallesen – formerly a member of the Norwegian national cooking team – will, together with his right hand man Lars Erik Kristiansen and the rest of the team, guide the cod, salmon, king crab, crayfish and shrimp on its culinary journey from the sea to your plate. is one man in a boat) caught a really good batch and you find yourself nibbling away at those. Or perhaps crab came in this morning and the team decided to make an Asian-inspired dish that just happens to go perfectly with that wine you ordered. Or maybe you thought: ‘You know what? Today I would like just the simplest of all’, and in front of you are shrimps, bread and some homemade aioli. Pure and simple and so tremendously delicious.